Long handled axes, rusted kitchen knives and a homemade cosh are just some of the weapons that make up the collection of Sir Sydney Smith; a collection recently catalogued and researched by the College. 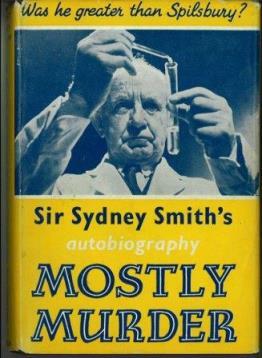 Sydney Smith was a renowned forensic pathologist well known for his autobiographical work ‘Mostly Murder’ in which he detailed many of his cases as a forensic expert. Having previously trained at the University of Edinburgh in medicine, Smith was persuaded to take up a forensic medicine post under the then Dean of Medicine, Sir Harvey Littlejohn in 1913. This post came to be the foundation for his later career as a forensic expert. After subsequent posts held in his home country of New Zealand and then as the medico-legal expert in Egypt between 1914 and 1927, Smith returned to Edinburgh in 1928 where he became Dean of Medicine following the passing of his former mentor Littlejohn. During the following 30 years Smith had an active career as both a university educator and as a forensic expert working alongside various Scottish police forces and the criminal high courts. It is for this period of his career that this most fascinating collection relates to. The series of weapons, which are arguably the show piece of the collection, provide a rich source of information on which a series of murder and suicide investigations can be followed through, of which Smith acted as the forensic expert. Many of the weapons have attached evidence labels, presumably attached when removed from the crime scene. The information gleaned from these labels, including the date of the crime, case the object related to, place it was found and often the name of the accused, has allowed us to understand why these items were in the possession of Sydney Smith. Connections between Smith and the weapons were initially looked for within paper case files held by the College. Unfortunately, none of these corresponded with cases identified through the evidence labels on the weapons. Instead, using an array of newspaper archives and high court records (held at the National Records of Scotland), it has been possible to place some of these weapons into the wider context of Scottish murder investigations, high court trials and the resultant verdict for the accused. 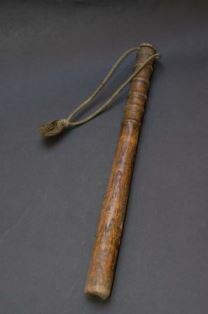 One such example is that of a short-handled axe identified as being evidence in the case against John Maxwell Muir. ‘The skull shows comminution of bone over the whole of the right side and back of the head with fissured fractures running to the left side. Evidence of separate blows can be seen at the back of the head, the front of the head, and the top of the head, all on the right side, and correspond to the injuries of the scalp…. The injuries of the scalp and skull were caused by several severe blows from an instrument of fairly heavy nature which has a cutting and also a blunt surface. 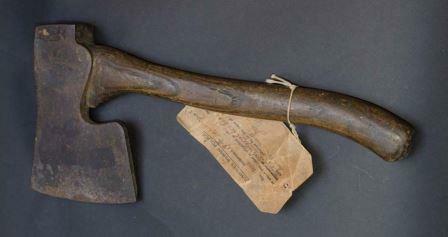 The axe sent to me for examination (label 1) could cause all the injuries found’. – 27th February 1933. (National Records of Scotland JC26/1933/98). John Maxwell Muir was found guilty of murder and sentenced to death but following an appeal this was reduced to a verdict of culpable homicide, due to mental disturbance caused by alcohol, and he was sentenced to penal servitude. Although the weapons could not be connected with the paper case files of Sydney Smith, some connections could be made between these and the glass negatives which form the larger portion of the collection. Identified amongst the slides were images labelled as being from the case against Peter Queen, a murder investigation from 1932 in Glasgow. There are several case files associated with this case and it features within Smith’s book ‘Mostly Murder’ (1959: 183), as an unusual case of strangulation with some dispute as to whether Queen was responsible. Cause of death was attributed to asphyxiation by strangulation, the victim was found with a scarf tied around her neck and then to the headboard of the bed, but suicide could not be ruled out. When reported to the police there was some dispute as to whether Queen had actually confessed as the police believe they heard him say ‘I think I have killed my wife’ although Queen denies this claiming he actually said ‘My wife is dead. Don’t think I have killed her’ (Smith 1959: 191). Peter Queen was found guilty, initially sentenced to death though this was reduced to penal servitude for life following petitions by citizens, MPs and councillors of Glasgow. The glass negatives show the victim, Chrissie Gall at the crime scene. 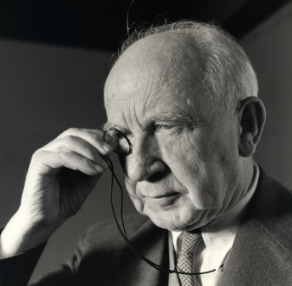 Further cases of Smith’s are referred to in the glass negatives, however, the main purpose of these slides appears to have been as a sizeable teaching resource from his time at the University of Edinburgh. There are thirty-nine boxes of glass negatives relating to aspects of forensic science and medicine divided based upon category and in excess of 400 loose miscellaneous slides. Amongst these are images of poisonous flowers, hair samples, fingerprints, firearms, firearm wounds, suicides, types of handwriting, putrefaction, burn wounds and powder samples alongside various tables and charts reported statistical data related to criminal cases. The material from this collection provides a wealth of information on early-mid 20th century forensic science, accentuated by some gruesome murder stories and fascinating imagery. 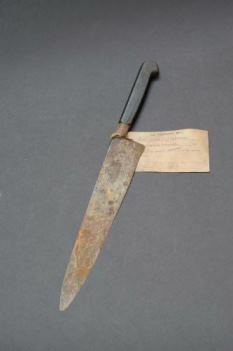 Images of all the weapons in the Sydney Smith collection can be viewed at RCPE Artefacts Online. JC26/1933/98 - Indictment against John Maxwell Muir . National Records of Scotland. Smith, S. (1959) Sir Sydney Smith’s autobiography: Mostly Murder.London: George G. Harrap & Co. Ltd. Author: Rebecca Cessford, Intern, Royal College of Physicians of Edinburgh.